Although no one knows exactly how much oil is leaking into the Gulf of Mexico per day, the National Oceanic and Atmospheric Administration has estimated the number to be about 5,000 barrels a day (or a whopping 210,000 gallons/day). But what does 210,000 gallons look like exactly? In order to paint yourself a picture, check out this nifty visualization we found over at The Architect’s Newspaper Blog created by Hulett Jones of the San Francisco firm Jones | Haydu. Basically, 10,000 barrels of oil spillage (approximately 2 days) would roughly fill up the size of a Victorian row house in San Francisco meaning that at this point, we’ve filled up almost 12 houses worth! 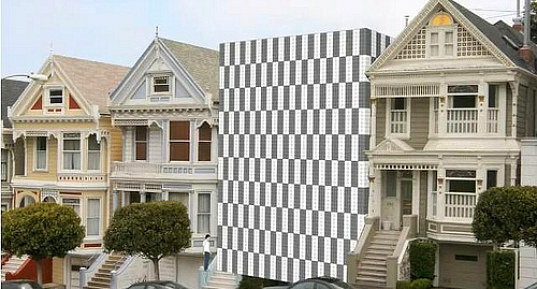 Hulett did some calculations capturing the amount of spilled oil as volume and tried to find an approximate equal – which turned out to be a row house in San Francisco. A Victorian row house may not seem that large, but on average each one is about 3.5 stories high and 5,500 sq feet, which is bigger than the average American house. And now, the equivalent of almost 12 of them is out there in the Gulf. Although no one knows exactly how much oil is leaking into the Gulf of Mexico per day, the National Oceanic and Atmospheric Administration has estimated the number to be about 5,000 barrels a day (or a whopping 210,000 gallons/day). But what does 210,000 gallons look like exactly? In order to paint yourself a picture, check out this nifty visualization we found over at The Architect's Newspaper Blog created by Hulett Jones of the San Francisco firm Jones | Haydu. Basically, 10,000 barrels of oil spillage (approximately 2 days) would roughly fill up the size of a Victorian row house in San Francisco meaning that at this point, we've filled up almost 12 houses worth!